Exeter City boss Paul Tisdale says he is trying to strike the right balance for the development of highly-rated teenage defender Ethan Ampadu. The 15-year-old became City's youngest player last month, but will return to school next week having spent the summer training with City's first team. "He's played particularly well, but we can't expect him to keep playing game after game," Tisdale told BBC Sport. "He's got a lot of expectation but we've got to be careful. " 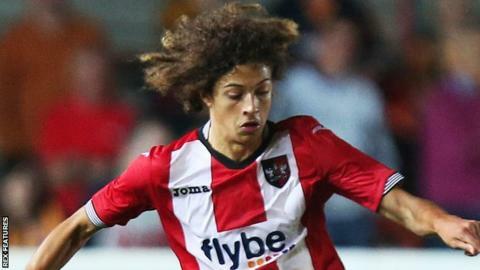 Ampadu made his debut in Exeter's 1-0 EFL Cup win over Brentford last month, drawing praise from his manager who said he looked like an experienced central defender, rather than a schoolboy. Young guns - how does Ampadu compare? In November 2008. Gillingham striker Luke Freeman was 15 years and 233 days old when he became the youngest person to play in the FA Cup's first round. Andy Awford played a preliminary-round match for Worcester City in 1987. aged 15 years and 88 days. The youngest international footballer was Lucas Knecht, who was 14 years and two days old when he made his debut for the Northern Marianas islands in a 9-0 loss to Guam on 1 April 2007. The son of former Swansea and Exeter midfielder Kwame Ampadu - who currently represents Wales at U16 level but is eligible for England - has since gone on to play five times for City, starting twice in League Two and twice in the EFL Cup. With City still struggling with a host of injuries - especially in central defence - Tisdale says he will now discuss how often Ampadu can be involved with his family and his school. "It's easier when everyone's sensible and understanding, no matter who they are," Tisdale continued. "St Luke's College have been very supportive of Ethan and I'm sure they'll do the best to give him the opportunity when it comes up, and the family are very supportive in terms of allowing us to make the right decision for Ethan at the right time.